Essentially this is a love story, just one that happens to involve the severed head of a suckling pig. You may already know how it all began, when Barcelona's most admired player of the time, Luis Figo, left to join Real Madrid in 2000. Two years later, the Portuguese midfielder's return to Barca in the white shirt of their bitter rivals produced one of the most dramatic evenings in Spanish football history. 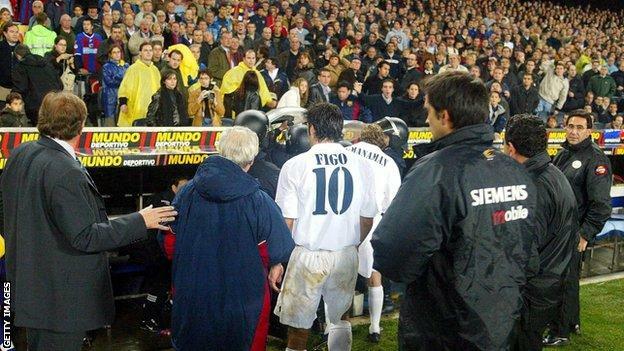 That Saturday, 23 November 2002, emotions ran high and a pig's head - among many other things - was launched on to the Nou Camp pitch in Figo's direction as Barca fans lashed out at a man they had once so adored. Here, witnesses to the match recall an extraordinary evening. There is heavy rain in Barcelona, drenched leather jackets and umbrellas are dripping in the stands, but still the atmosphere is electric. The players are about to take to the field. It is Figo's second match at the Nou Camp since leaving Barcelona. Returning for a league game in October 2000 he was jeered for 90 minutes, and he missed two subsequent fixtures through injury and suspension. Hostility has only grown with time - tonight will be something else entirely. I'll never forget it; it was a spectacular night. That kind of noise, that atmosphere - I've never experienced anything like it before or since. We'd built up an enormous affection towards Figo during his five years at the club. I was actually kind of in love with him, and there was a real feeling of betrayal around his move to Madrid. We were all expecting some kind of reaction towards him but we weren't expecting what happened. We had a programme that went out for 16 years on Canal+ in Spain called El Dia Despues (The Day After). Before the match, we put microphones by the side of the pitch. When Figo's name was read out, the decibel reading we got was equal to a jumbo jet taking off. Sometimes in Spain, rivalries go beyond sport. We're talking about a country that not too long ago had a dictatorship. Barcelona is 'Mes Que Un Club' for its place within Catalan culture, and there's political connotations over the bad treatment the region experienced under Franco. So Luis Figo appeared to make the greatest betrayal possible by signing with Real Madrid. These were the conditions that created the most visceral reaction I've seen in my life in any sporting arena. The Barcelona fans adored Figo, and because they felt so close to him they couldn't understand how he could leave them in that way. They conveyed this to him in their reaction in the stadium that night. To this day they still feel affected by it. When I arrived pitch-side the fans were already whistling loudly as Madrid came out of the tunnel to warm up before the match. Some of those near me were holding up placards with big dollar signs on them. It was an extraordinary night but it's also true that in other grounds on several other occasions fans would jeer and throw things at Madrid's players. The big difference is that to throw a pig's head you really need to come prepared. 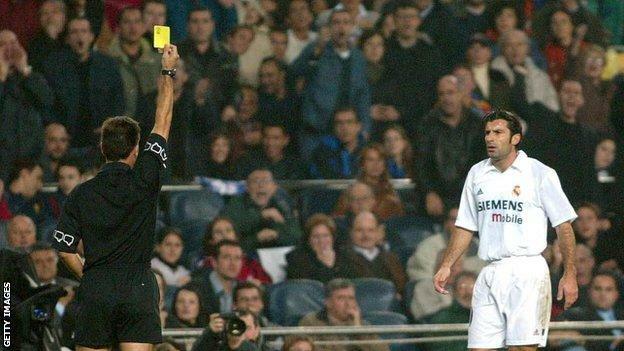 The whistles and jeers increase in volume as Figo is shown a yellow card for a late challenge in the opening minutes. Team-mate Raul goes on a mazy run and wins a corner. Figo goes over to take it. Objects are thrown from the stands on to the pitch around him. Officials in yellow rain macs hold back supporters leaning over the front row and shouting abuse. Figo drifts the ball expertly to the far post where Esteban Cambiasso draws a save from Roberto Bonano. Another corner, and the volume rises again. It's a rivalry that carries so much passion. It's not only football but a way of life; playing for Barcelona, you play for all the Catalan people. When facing Real Madrid you are representing the club but you are also playing for everything that Catalunya represents - that is why the game is so important. 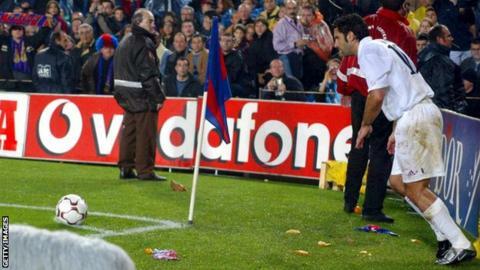 I had played for Barcelona for five years by that time, but even I didn't expect them to be throwing things at him. When a player goes from Barcelona to Real Madrid, the people are hurt, and at that moment they were even more hurt, because it was Luis. Luis was taking all the corners. I told him as a joke, it's better you don't take them, because it was a really, really hostile atmosphere. People were throwing lighters, coins, plastic bottles. Someone threw an (empty) glass whisky bottle that I took a photo of, but the pig's head I didn't see. I don't remember when it came on to the pitch, but every time Figo would take a corner objects rained down from the stands. One photo I took became the front page image of my newspaper ABC the next day - Figo taking a corner surrounded by policemen dressed in riot gear, with their heads covered so none of the objects thrown down from the stands would hit them. We were high up in the middle stands, but you could see all the objects flying on to the pitch every time he went to take a corner. Then of course, it was all over the television and in the papers after the game. Now when I think about it, my god, we really did go a bit crazy. Figo takes his first corner since changing ends at the break. Fans continue to throw things towards him. He makes a point of clearing several plastic bottles from the pitch in front of him and the noise level rises further still. There are almost 100,000 fans in the ground and this corner is closest to the section occupied by members of Barcelona ultras group the Boixos Nois. The referee holds up play while he speaks to Barcelona's captain Phillip Cocu and to Carles Puyol, who then immediately appeals to the stands for calm, waving his arms. Figo goes over towards the corner again but more objects rain down from the stand. After another pause, riot police gather and deter fans from throwing more. He eventually swings in the corner at the third attempt and Roberto Bonano is almost beaten directly from it, tipping over his own bar. Another corner, from the other side. Figo jogs over to take it and more objects are thrown on to the pitch, more than before. Puyol is gesturing wildly for calm but the referee suspends the match. It is resumed 16 minutes later. Obviously I'm not the one who decides whether the game should go on but I got up from my seat. I said to Florentino Perez, the Real Madrid president who was next to me, I'm going so they don't suspend the match. I went down towards the dressing rooms to plead with the match officials, and I also made sure there was an announcement over the speakers asking for calm in the crowd, which worked. From then on there were no more objects, just words. I wouldn't say Figo's attitude was provocative, but if a player goes over to take a corner… in any case none of the many objects that were thrown hit him. When I see Figo now, it's just hello and goodbye, the minimum. Polite, but the minimum. After the way he played Barcelona, it didn't leave me with a good feeling, and I think the club deserved more. 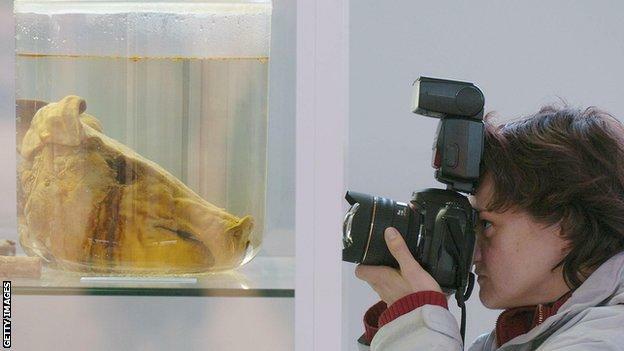 I didn't know it was a pig head until the end, when I was in the locker room, and they said it. I mean, it's not normal, that was my reaction! It went too far because you should never throw things on the field but it happened because a lot of emotion came free. Luis Figo was not only one of the best players we had but also one of the most popular, so it was twice as hard, him going to Real Madrid. There was the bottle of whisky embedded into the grass, there was the pig's head, and looking only at those things it might look like a lynch mob. I prefer to understand it in a completely different way. 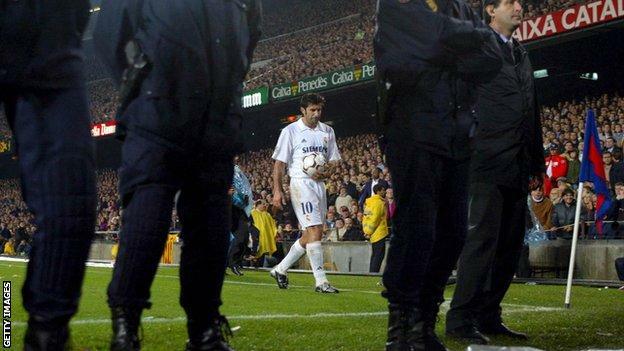 After the match, Gaspart suggests Figo provoked the home fans in some way. Barcelona manager Louis van Gaal says he should have been sent off. Madrid boss Vicente del Bosque praises his winger. Figo, speaking immediately after the game, says: "I'm not sure if Gaspart is joking or not. And I'm surprised Van Gaal referred to me in the media because he never once did in the two and a half years we were together at Barcelona, and I saved his arse on more than one occasion." The noise and the atmosphere, the whistling, all of that must have had a huge impact on Figo. I've no idea how he coped with it all, he played pretty well. We spoke to the person who threw it. It's not rocket science, the meaning is clear. The pig's head is: I'll throw its head on the pitch because that's what you are, a pig. You deceived me, you broke my heart. I know Luis, and I spoke to him about this. To some degree it is testament to how much he was loved. I told him once: they could only do that because they loved you. I am not going to speak about hatred, I don't think even those people who booed him were hating him. They were saying: You're a traitor, you're a sporting traitor. It was a reaction from ordinary, decent people. Something erupted.